about the living conditions of spirits. Does this mean that it is not mathematics? ---Ludwig Wittgenstein, Remarks on the Foundations of Mathematics. This is an early prototype of a proposed website designed to introduce to a broader audience my more technical research on the early history of Chinese linear algebra, to be published in The Chinese Roots of Linear Algebra (Johns Hopkins University Press, 2010, summarized below). This website is in the very early stages of development, and is at present intended for demonstration purposes only. Through these web-pages, users will be able to do the following: (i) calculate solutions to linear algebra problems using methods found in early Chinese mathematical texts; (ii) solve alternative problems of their own construction; and (iii) contribute possible solutions that they discover to these problems. (2) A database of all Chinese mathematical treatises containing linear algebra problems. (I estimate the number of treatises will be less than one hundred.) I will add brief historical notes for each text. (3) A database of all the linear algebra problems found in all Chinese mathematical treatises. (I estimate the number of problems will be around a few thousand). Users will then be able to solve any of these problems using any of the applicable methods of calculation (above). All of the programming up to this point is my own. I am currently applying for funding to support further development. In China, from about the first century C.E. through the seventeenth century, anonymous and most likely illiterate adepts practiced an arcane art termed fangcheng 方程 (often translated into English as “rectangular arrays”). This art provided procedures for manipulating counting rods on a counting board, which enabled practitioners to produce answers to seemingly insoluble riddles. This art seems to have been closely aligned with other mathematical arts, including various forms of calculation, numerology, and possibly divination. While we know virtually nothing about these practitioners, records of their practices have been preserved: these practices were occasionally recorded by aspiring literati and incorporated in texts they compiled on mathematical arts, which were then presented to the imperial court, together with prefaces claiming that these mathematical arts were essential to ordering the empire. In their prefaces and commentaries, these literati sometimes assigned credit to mysterious recluses, apparently to support the claimed exclusivity and authenticity of their compilation; yet at other times the literati compilers also denounced fangcheng practitioners for overly arcane techniques, apparently in an attempt to reassert their own higher status and authority. Over this period of perhaps sixteen centuries, bibliographies of imperial libraries record the titles of hundreds of treatises on the mathematical arts (suan fa 算法). Many of these are still extant, and many include fangcheng problems. Fangcheng, an art which apparently found no practical application beyond solving implausible riddles, is remarkable for several reasons: it is essentially equivalent to the solution of systems of N equations in N unknowns in modern linear algebra; the earliest recorded fangcheng procedure is in many ways quite similar to what we now call Gaussian elimination; finally, there is a reasonable possibility that these procedures were transmitted to Europe and Japan, serving perhaps as precursors of modern matrices, Gaussian elimination, and determinants. Linear algebra is one of the core courses in most university undergraduate mathematics curricula, yet relatively little has been published on its history, especially its early history before 1700. A book I have recently completed, Chinese Roots of Linear Algebra, shows that the methods taught today in modern linear algebra can be found in mathematical texts in early imperial China. More specifically, in modern linear algebra there are two fundamentally different methods for solving systems of n linear equations in n unknowns: Gaussian elimination and determinants. Determinants have previously been held to be a simultaneous, independent discovery by Leibniz (1646–1716), a sinophile, and the Japanese mathematician Seki Takakazu (ca. 1642–1708), who studied Chinese mathematics. Determinants, it has seemed, were created ex nihilo, a simultaneous but precipitous discovery, without significant earlier precedents or a history of development. And while it is now widely recognized that the first method—Gaussian elimination—first appeared at least 1500 years before Gauss (1777–1855) in a Chinese mathematical treatise titled Nine Chapters of Mathematical Methods (Jiu zhang suan shu 九章算術, c. 100 C.E. ), it has been the general consensus among historians—even specialists in the history of Chinese mathematics—that Chinese techniques for solving linear equations showed little development, and that determinantal methods were never discovered. Perhaps it is because of this presumed lack of development that the history of linear algebra in imperial China has not seemed to merit deeper study. This, then, is the first book-length study in any language of linear algebra in imperial China. I argue that the early Chinese mathematical treatises are only very brief transcriptions of complex mathematical practices. 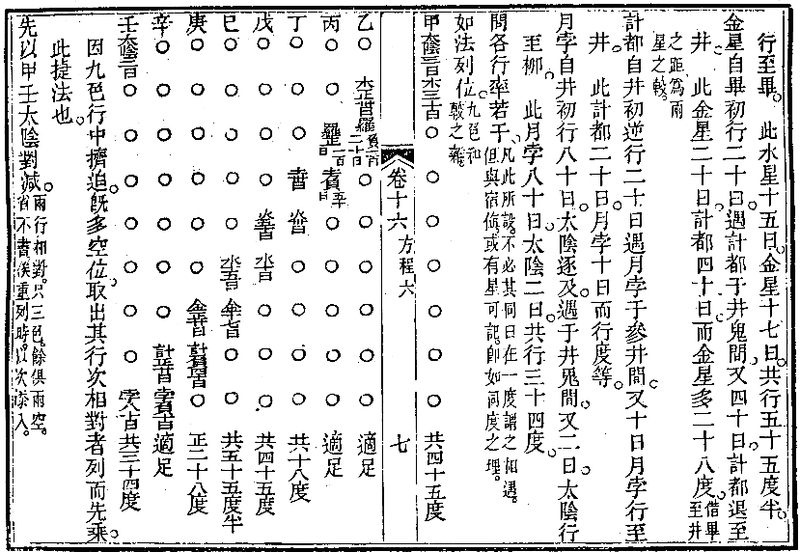 That is, records of Chinese linear algebra that have been preserved in extant mathematical treatises (such as the Nine Chapters) should be seen as translations of fangcheng practices into narrative form, compiled by literati-officials seeking patronage in the imperial court by promoting these practices as important to ordering the empire. My central thesis is that the essential feature in the solution of these problems is the visualization of the problem in two dimensions as an array of numbers on a counting board and the “cross-multiplication” of entries, which led to general solutions of systems of linear equations not found in Greek or early European mathematics. There are, I argue, two distinct types of “cross- multiplication” found in extant Chinese mathematical treatises, which correspond to the two methods used to solve problems in modern linear algebra today: (1) the “cross-multiplication” of individual entries, which corresponds to determinantal solutions; (2) the “cross-multiplication” by individual elements of an entire column, which corresponds to Gaussian elimination. (1) The fangcheng procedure presented in the Nine Chapters is somewhat more complicated than has often been recognized, differing from Gaussian elimination in that it uses a counter-intuitive approach to back-substitution to avoid calculations with fractions. This suggests that fangcheng practices were considerably more sophisticated than has been previously understood. (2) The problems recorded in the Nine Chapters provide evidence that suggests that, in special cases, determinantal methods were used to solve systems of linear equations. The earliest extant written record that I have found of a determinantal calculation is preserved in a commentary to the Nine Chapters dated 1025 C.E. The earliest extant written record of a determinantal solution that I have found is preserved in a compilation dated 1661 C.E. I conclude that forms of the two fundamental methods of “modern” linear algebra -- determinants and elimination -- can be found in early Chinese fangcheng practices. The mathematical techniques recorded in the Nine Chapters and similar texts were apparently practiced by anonymous savants, who were likely themselves illiterate, and likely solved problems as a kind of art. This website will allow users to calculate solutions to linear algebra problems using methods found in early Chinese mathematical texts (ca. 150 BCE to 1700 CE). That is, instead of simply reading written historical descriptions of early Chinese linear algebra, users of this website will be able to recreate the practice. Specifically, users of the website will be able to work through Chinese linear algebra problems from over a thousand years ago step-by-step; they will be able to change the very limited number of examples preserved in extant treatises to solve other similar problems, as savants of this period would have done themselves. Finally, this website will allow users to seek, as the early practitioners would themselves have done, shortcuts and solutions to solving specific forms of the problems. Through re-creating this practice, some users will, I hope, discover methods for solving specific forms of problems in linear algebra exemplified by the problems given in Chinese mathematical treatises. They will then be able to contribute these possible reconstructions for our evaluation, to be posted on this website. I believe that I have solved the most important technical concerns in setting up this website in the prototypes I have already developed (see the web-pages listed above). These web-pages use the Perl module CGI.pm for user input and Perl for calculations. Images of the Chinese counting board, together with their translations into modern matrices, are produced using a utility called mathtex, which uses to create PNG images, and xy-pic. I plan to also add “Monte-Carlo” simulations using webMathematica. With further funding, I hope to obtain technical assistance so I can focus on adding content. This is a very brief sample of the content I hope to present in this website, including an image of a fangcheng problem from a Chinese mathematical treatise, and the transcription of that problem into modern mathematical terminology. Calculations of the solution to this problem and others are available on the linked pages listed above (and also listed in the sidebar). For my previous archival research in China, I programmed a database to keep track of authors and biographical information, treatises and publication information, collectanea (congshu 叢書 – collections of reprints of treatises) and their current locations, and libraries. I plan to transfer this database to a web-accessible database, and add any remaining extant Chinese treatises on mathematics I have not yet recorded. Once the source code I have developed is somewhat improved and readable, I will make it available through this website, including all the coding for LaTeX macros, xy-pic drawings, Perl calculations, and the CGI.pm interface. I will also try to include notes on installation, such as on installing mathtex and necessary packages in a user directory, etc.